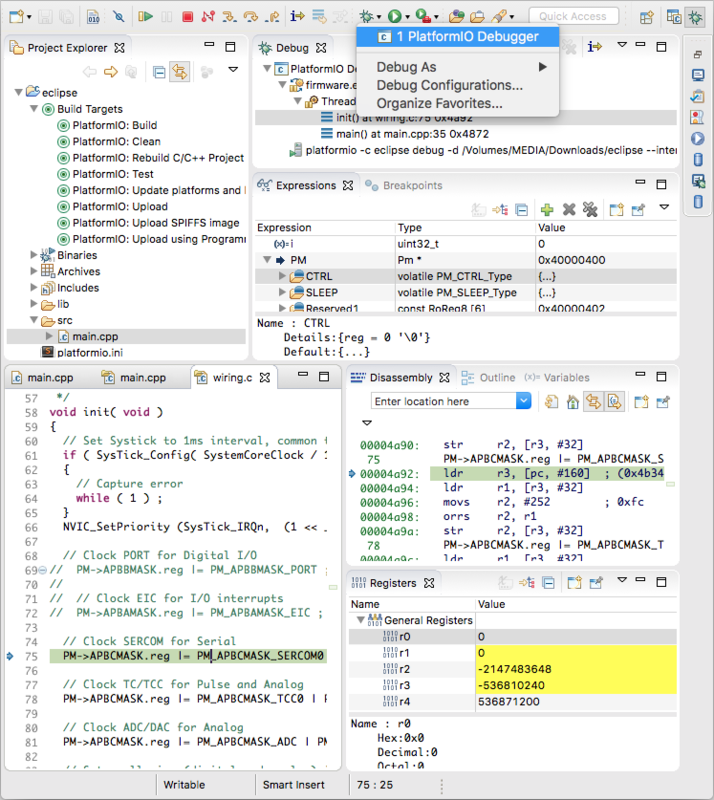 The Eclipse CDT (C/C++ Development Tooling) Project provides a fully functional C and C++ Integrated Development Environment based on the Eclipse platform. Features include: support for project creation and managed build for various toolchains, standard make build, source navigation, various source knowledge tools, such as type hierarchy, call graph, include browser, macro definition browser, code editor with syntax highlighting, folding and hyperlink navigation, source code refactoring and code generation, visual debugging tools, including memory, registers, and disassembly viewers. Refer to the CDT Documentation page for more detailed information. PlatformIO: Clean - Clean compiled objects. PlatformIO: Rebuild C/C++ Project Index - Rebuild C/C++ Index for the Project. Allows one to fix code completion and code linting issues. Refresh Project, right click on the project Project > Refresh (F5) or restart Eclipse IDE. The libraries which are added, installed or used in the project after generating process won’t be reflected in IDE. To fix it please run PlatformIO: Rebuild C/C++ Project Index target and right click on the project and Project > Refresh (F5). The C/C++ GCC Cross Compiler Support package must be installed in Eclipse, otherwise the CDT Cross GCC Built-in Compiler Settings provider will not be available (check the Providers tab in Project > Properties > C/C++ General > Preprocessor Include Paths, Macros etc. for a marked entry named CDT Cross GCC Built-in Compiler Settings). If this provider is not available, toolchain related includes cannot be resolved. 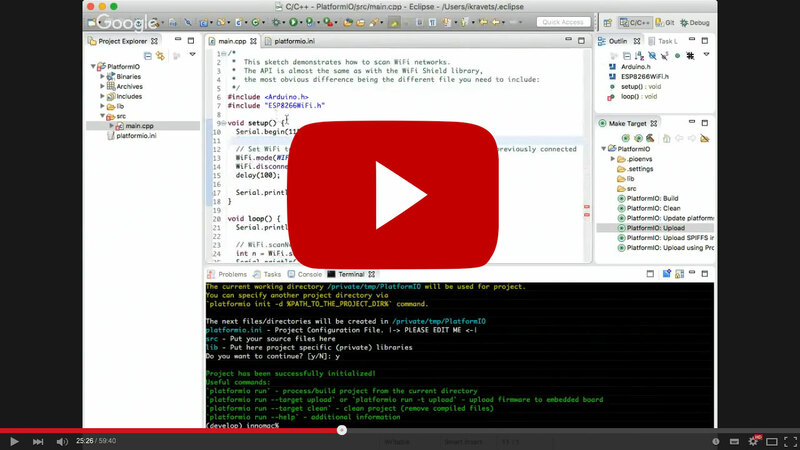 Eclipse Virtual IoT Meetup: PlatformIO: a cross-platform IoT solution to build them all! Launch debugger via “Menu: Debug” or “Bug Icon” button on Tool Bar.